Today I am declaring war. I can see, that I got your attention! What am I declaring war on? DUST! I know that there are plenty of ways to remove dust from negatives in post, but the best way of course is to properly dry your negatives in a (nearly) dust-free room. Top Tip here: hang your washed film in the bathroom and before you hang the film, turn on the shower with hot water for 1-2 minutes till you have a foggy bathroom, hang your film, and close the door. If you washed your film good enough, your negatives should come out pretty dust-free. 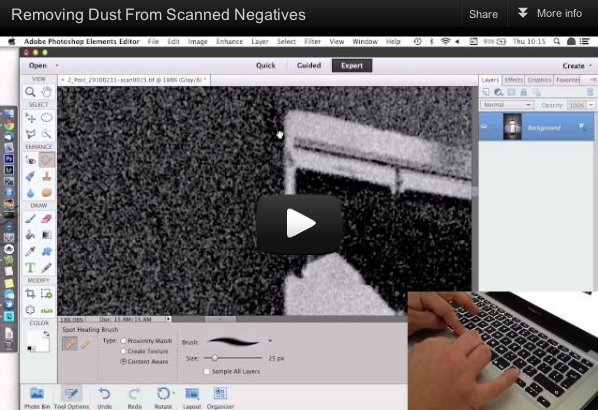 And for all the remaining dust spots, or if you have scratched your film, lean back and watch my brandnew video on how to remove dust from a scanned negative, using Adobe Photoshop Elements 11. I will post other methods as well, if there is any interest. Make sure to tell me your favourite image editor or your method to remove dust. You can also join our wonderful facebook group and meet lots of other caffenol addicts. One thing I do occasionally is to run the stop and fixer through a coffee filter. Makes a lot of difference, more than worrying about dust-free environments!